is to be supported and celebrated by a community. Courtney works hard to ensure that all families receive the support and resources they desire for their pregnancy, birth and postpartum period. 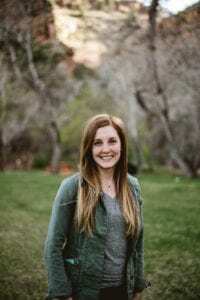 Her most recent doula experience includes time on the Denver Health Labor and Delivery floor, but she is enthusiastic to support you in your home or birth center birth. Courtney enjoys practicing yoga, cooking, meandering the farmer’s market in the summer, running her with puppy, Stewart, and climbing in the foothills. She enjoys reading about how birth is celebrated and the traditions surrounding birth in other parts of the world. She is working diligently on her Spanish-language skills to help serve families who speak Spanish- so be sure to practice with her when you see her! When you book Courtney as a doula, you’ll receive two prenatal visits, continuous labor support when you call, and one postnatal visit. Courtney will loan you books from her birth library and if requested, provide you with the latest research in birth practices in the United States (she’s a bit of a science geek). For more information on Courtney’s birth doula services, click here.